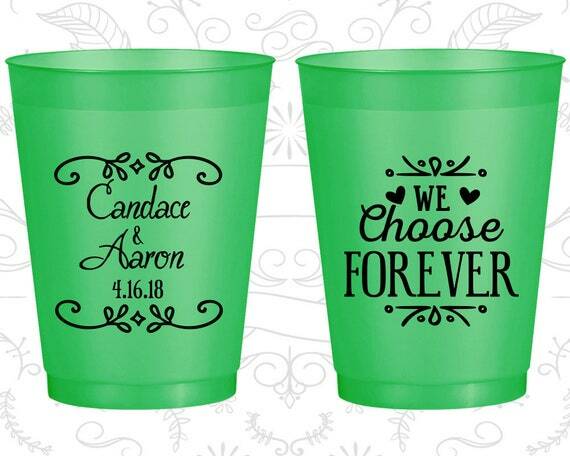 We Choose Forever, Personalized Frost Flex Cups, Vintage Wedding, Love Wedding, Romantic Wedding, Silver Frosted Cups by My Wedding Store! Everything in my shop can be Customized! 1. Artwork Proof will be emailed to you within 2 business days. 2. Once approved, the product will be sent to production. 3. Once shipped, we will send you a tracking number. - when cup is filled to the brim with water. - and plastics are beyond our control. • Imprint is not guaranteed to stay on. • When splitting cup colors, all cup size must be the same. • Rush is offered for certain items. • Rush options can be found in the cart page. • Rush days exclude weekends & holidays. • Specify delivery date in the "Note" section. • Artwork proof is emailed within 48 hours. • To meet rush date, approve within 12 hours. - will cause delivery date to change by 1 day. • Color splits are offered for certain items. • We allow up to six product color splits. • The imprint color must be the same. Color splits are offered for certain items. Should you require part of your order to be printed in a different ink color within a production run using the same artwork, there is a color split charge of $20.00. This upgrade includes adding a second ink color on half of your order, not two inks per item, printed together. Please message us for a custom listing. Should you require part of your order to be printed with a different artwork within a production run, you will be required to place a separate order. ✓ Verify - Product & Quantity is correct. ✓ Verify - Product Color(s) are correct. ✓ Verify - Imprint Color is correct. ✓ Verify - Delivery Date is correct. ✓ Verify - Design(s) are correct. ✓ Verify - Spelling is correct. ✓ Verify - Layout is correct. Once your artwork proof has been approved, changes cannot be made as your order will be in production. Due to variation in monitors, smartphones and tablet displays, seller is not responsible if the colors show differently in person. All orders are shipped to the address on your PAYPAL / ETSY account. We ask that you verify that the address listed is your correct and current shipping address before you submit your order. Your shipping address links to your account but can be easily edited prior to purchase. Shipping address change after the products have gone into production are not guaranteed. We are not responsible for packages that are shipped to the wrong address due to inaccurate information provided. We cannot be held liable for any package(s) that are stolen, lost, or delayed in transit or after delivery to the address you have given us. If your shipment was expected to arrive by the due date yet is delayed because of weather, natural disasters, riots, strikes or unforeseen events on the shipper's end, we will not be held responsible. Customers are responsible for their country's duty, import taxes and brokerage fees which is due upon delivery to the shipping company. We are not responsible for delays due to customs. The shipping amount My Wedding Store charges does not include these fees. An accidental over or under run of 5% will constitute a complete order. Every attempt will be made to minimize these amounts. By visiting our store, you agree that you will not copy, distribute, print, download or otherwise reproduce any of My Wedding Store product images or designs. When submitting your own artwork for use in a finished product, you affirm & warrant you own the patent, trademark, copyright or have the licenses, rights & permissions to reproduce the artwork. My Wedding Store is to be held harmless regarding any legal matters. Our products are not designed or intended primarily for children 12 years of age or younger, our product does not fall under the guidelines of CPSIA. The testing & labeling requirements of CPSIA do not apply to our product. Any broken item or defective merchandise must be reported within 5 days of delivery. Claims will not be honored after this period. Broken or Defective Merchandise may only be exchanged for the same item. Due to the nature of the production process, slight variations and small imperfections are not considered flaws. Variation in materials, production equipment and firing temperature may result in variations in size, shape, glaze color, etc. These conditions are within acceptable industry standards and are not considered defective. Due to the custom nature of the product, all sales are final. If there is an error on our part we will gladly send a corrected replacement or issue a refund. Please make sure to contact us within 5 days of delivery to receive a return authorization. Make sure you return the items back to us within 14 days of delivery. Shipping is non-refundable. - we will match it and beat it by 10%. • Item must be identical. • Item must use same printing method. • Item must be in-stock at retailer's website. • No rain-checks for items not in stock. • We price match one item per day. • Does not apply to refurbished / closeout. • Not valid after 5 days of your purchase.